There are many different Words used throughout Spanish speaking countries across the world. There are too many to list so the Spanish words we have selected are the most popularly sought and searched for online. This site aims to educate kids, adult, tourists and provide a useful educational teaching resource to schools. We have selected all sorts of words including the most popular and common, easy and basic, question words to help with enquiries and words of affection which are used when speaking to partners, close friends, kids and family members. The lists of Spanish words are printable for free and will help increase the knowledge and vocabulary base of kids and adults - increasing their understanding of the language and giving them the confidence to partake in conversation with Spanish speakers. Pronunciation is vitally important when speaking any foreign language. Please feel free to practice your listening, understanding and speaking skills with our selection of pronunciation videos which are dotted around this free online guide to speaking Spanish website. 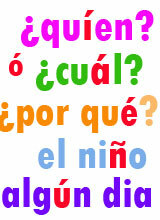 We aim to make learning words in Spanish interesting for children as fun learning encourages kids to learn more. The sections above, in particular basic Spanish words, are easier for children and beginners to learn, understand and remember. The list of simple Spanish words provides a quick way for a beginner to learn important and common vocabulary to use in Spain and other Spanish speaking countries. The list can be given to children for lesson or homework help or even printed out for tourists to take on holiday to help practice their Spanish and make themselves understood. The best way to learn how to say Spanish words properly is to ensure your pronunciation of letters and words are correct. To help and teach correct pronunciation we have provided various methods. Please visit our Spanish Alphabet section which is linked from our home page. It is very important to learn the letters of the alphabet as they provide the basis to speaking this language properly. The sounds of the letters are very different to English and listening, understanding and being able to hear these differences are the key to learning and saying Spanish words. There are free audio language videos located towards the bottom of our topic pages to help with Spanish words pronunciation. For teachers, tutors or anyone looking for printable Spanish words flashcards with pictures for kids including young children, babies, toddlers and preschoolers. Please refer to our flashcards with pictures for kids section which is linked from our home page. There are many sets of quality cards, including the alphabet, animals, numbers and colors, to choose from which are free for anyone to use and print out.